√ Provide a great deal of positive touch such as carrying, cuddling, and holding. Skin-to-skin contact is recommended. 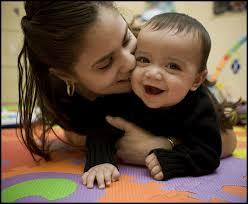 √ Give immediate responses to a baby’s cries and fusses. You can’t spoil a baby. It is ideal to meet the baby’s needs before she gets upset and her brain floods with toxic chemicals. If the response to her cries is immediate and warm, this keeps her brain calm in the years when she is forming her personality and ability to respond to the world. The baby grows up to be a more compassionate and empathetic adult, with better socioemotional skills that are more necessary than ever in our technologically hypercompetitive world. √ Implement breastfeeding, which ideally goes until the child is between 2-3 years old. Breast milk provides building blocks for the child’s immune system. √ Engage multiple adult caregivers (beyond just dad and mom) who also love the child—e.g. grandparents, older siblings, loving daycare providers. √ Provide free play opportunities with children of multiple ages. A lack of adequate play time may contribute to ADHD and challenges to mental health. √ Expose our children to nature as much as possible. Children who are regularly exposed to nature tend to be calmer, happier, and more focused than children who remain indoors most of the time. More will be said about this in a later chapter. In sum, implementing all of these suggestions will help our children, at the beginning of life, to gain a secure and strong base of attachment. This base is critical for helping them be happier, more secure, more resilient adults.